An hour flight from Hue brought me to Hanoi…but more of that later. 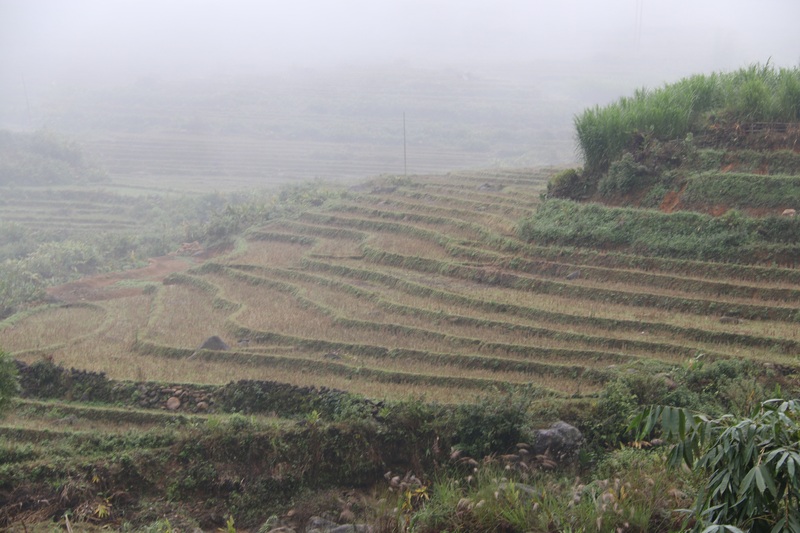 Up in the hills north west of Hanoi is the hiking base of Sapa. The overnight train was comfortable without being luxurious. The hillside hotel offered wonderful views from my room’s balcony looking across the hills…but not in the prevailing extremely foggy conditions that met me. A short walk on day one in the drizzle whetted my appetite. Day two offered two choices on another foggy day. The first was dropping down from our elevation of 1500 metres to two villages that were both attractive but on the tourist route. This promised better climatic conditions. The second option was ascending to 2200 metres where it was likely we’d be met by very restricted views; but no tourists. Option two proved the victor in this easily fought tussle of mind; and whilst the area was covered by a blanket of fog, I was rewarded to a most wonderful experience. 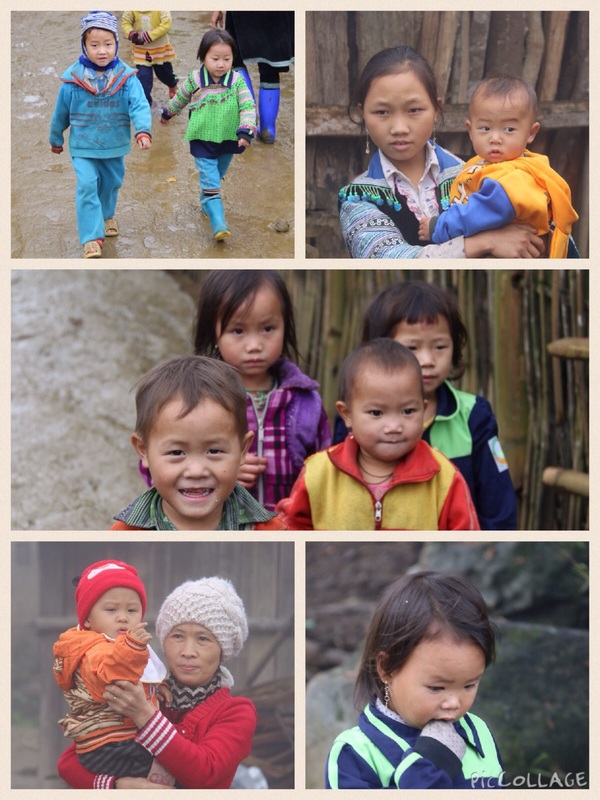 The village of Ta Giang Phinh is only 24km from Sapa, but ninety minutes by bus…almost! The torturous road is blighted by landslides and is constantly under repair. The last part of the journey is either by scooter or motorbike, crossing a fast flowing ford; or walking via a ‘wobbly’ bridge. The latter option took a further half an hour. The buildings are as simple as can be, timber planks with corrugated tin roofs. The main commerce is the once yearly rice harvest. Life is tough. Whilst not pretending that this village has never seen westerners before, we certainly were a novelty; inspected with curiosity and welcomed with warmth. School children marvelled when seeing photographs of themselves, and mothers beamed with pride when shown family portraits. A quick ‘whip-round’ secured the one and only shop’s entire supply of sweets for distribution to the children of the village through the nursery and primary schools (paper and pen are apparently plentiful!). The impromptu visit was the ‘highlight’ of Vietnam for me. 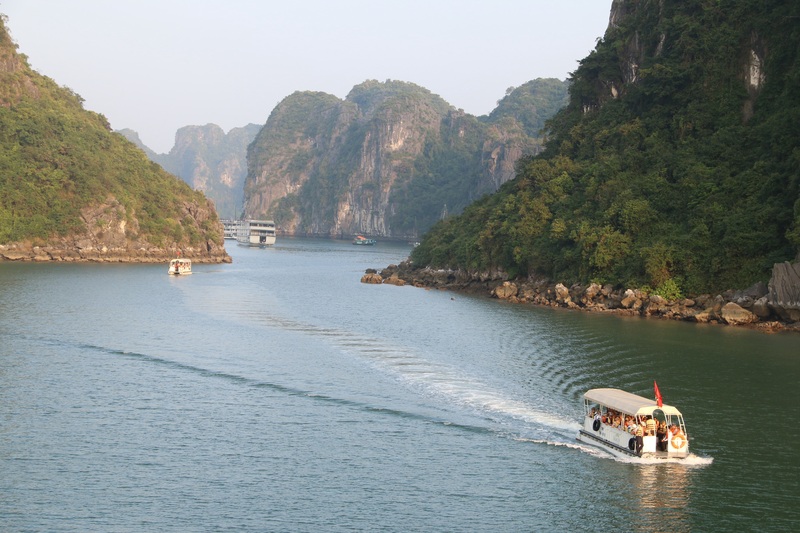 Down from the hills, Halong Bay was recently added to one of the current seven wonders of the world. And it lives up to expectations. The limestone monoliths rising from the calm waters are beautiful, and one hardly notices the flotilla of boats that travel out daily. The sunset and rise were sadly obscured by cloud, but breaks in the weather afforded opportunity for good photography. Which leads us back to Hanoi. 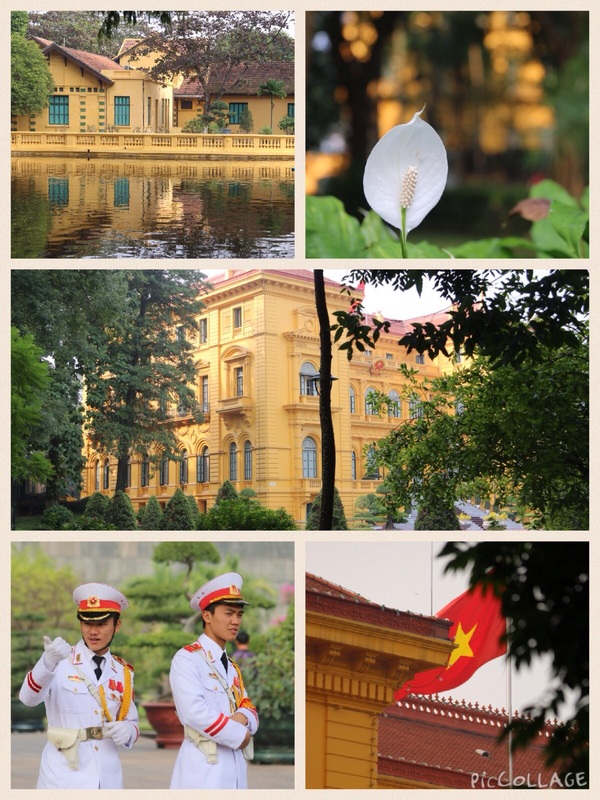 The capital of Vietnam, it is a frantic city but without the humidity of Saigon. The architecture is predominantly french colonial. The grounds of the Botanical Gardens house the former Presidential Palace, still used today for ceremonial visits by foreign dignitaries. Originally designated to be used by Ho Chi Minh; he preferred to live in a more modest three room stilt-house in the grounds. The park provides an oasis of calm from the mayhem that surrounds it. The palace sits aside Minh’s mausoleum, sadly closed during the autumn months. The Thang Long Water Puppet Theatre offers a fifty minute show that entertains adults and children alike. The puppeteers stand in waist deep waters whilst manipulating their charges from behind a bamboo screen. The puppets project flumes of water, pyrotechnics, and smoke. The singing is evocative of ancient Vietnam. The adjacent Hoan Kiem Lake has its own fifteenth century version of the Arthurian Excalibur legend. Whilst the Museum of Ethnology offers a look back in time with both internal and external exhibits. in contrast to the meekness of Ta Giang Phinh, Hanoi can be a city where boundless enthusiasm and joy are never far away. 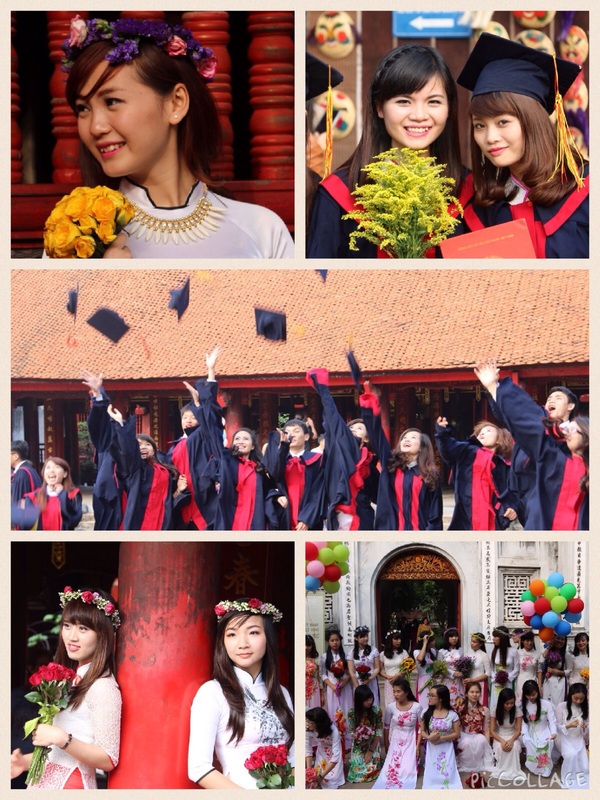 This was never more apparent than when a temple becomes the site of a graduation ceremony. The students were not only joyous, but exuded a confidence which was palpable. There was also a sense when viewing the females that they were not only beautiful; but knew it. Personally, I felt that beauty lay with the people in the hill tribes. Cuisine here is eclectic. There is an obvious Chinese influence; but french food is still present. One notable mention is the restaurant, ‘pots ‘n pans’ that delivers a fusion of Vietnamese and French. So Vietnam is done. A two week trip gives an excellent overview of a country whose history is far more than a war. As the adage goes…”you think you know Vietnam; you weren’t there”.